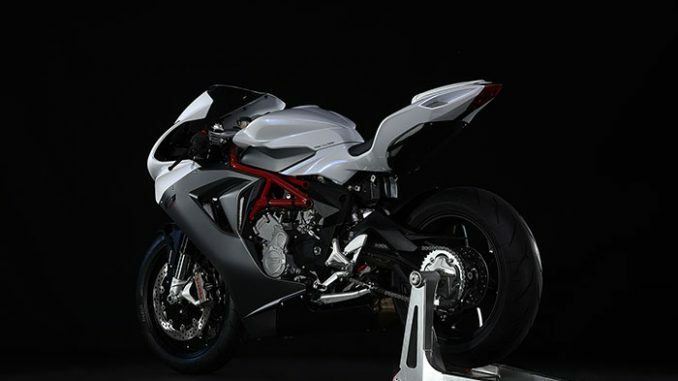 The counter-rotating crankshaft exudes the racing spirit of the bike: derived directly from the GP race track, this solution reduces the directional inertia of the bike to make it even easier to ride and instantly responsive, with the unique character typical of an MV Agusta. At just 1.17 Kg/hp, the power to weight ratio is extraordinary. Denominated M4.34 a, these Brembo monoblock calipers are conceived to generate safe and easily controlled deceleration. in traffic – without compromises, thanks in part to the Bosch 9 Plus Race Mode ABS system with RLM (Rear wheel Lift-up Mitigation), which comes as standard. These calipers are radially mounted to transfer all of the braking torque to the 320 mm diameter discs. At the rear, a 220 mm steel disc with a two-piston caliper contributes to controlling the load transfer. Engine management is one of the strong features of the MV Agusta F3 800. With an integrated electronic control system overseeing everything from the Ride-By-Wire throttle to the injectors, the rider can tap into instant, incredible urge from the three-cylinder powerplant even at low engine speeds, for outstanding performance in all conditions. Weighing in at just 52 Kg, the extremely light engine boasts state of the art technical solutions such as double overhead camshafts with titanium valves and water and oil circuits integrated in the crankcase, for maximised compactness and overall efficiency. Have it all with the MV Agusta F3 800, from class-beating riding pleasure and performance to sophisticated electronic engine management with four engine maps and eight levels of traction control. The three-cylinder engine is the pinnacle of motorcycle engineering: it’s extremely light and compact (weighing just 52 kg) and uses a “closed-deck” shell mold cast crankcase with integrated cylinders. The water and oil circuits are integrated into the actual crankcase castings and their respective pumps are located inside the engine with obvious advantages in terms of styling as well as compactness. 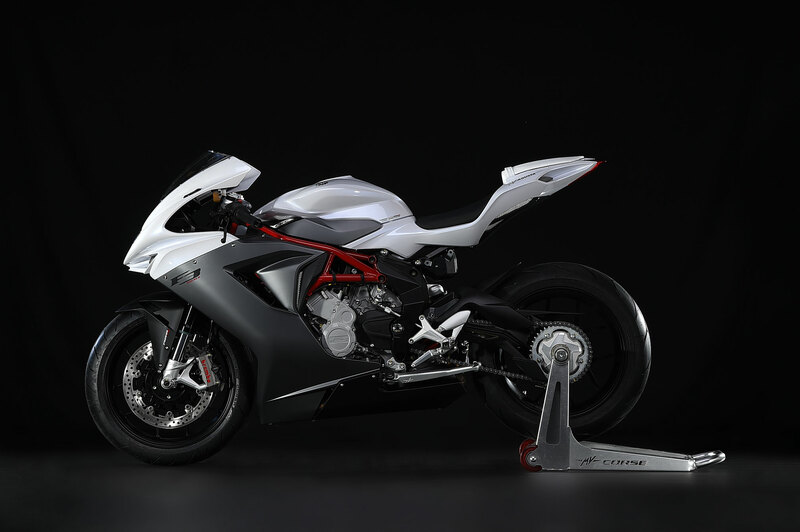 Among the innovations on this three-cylinder MV Agusta F3 800 is the counter-rotating crankshaft, a technical solution that prior to the F3 675 was only available on MotoGP motorcycles. The objective? To reduce the rotational inertia effect during quick directional changes and to improve the vehicle balance with the resulting ease of handling of the F3. The considerably higher performance is reflected, for the same bike mass, in an increased power-to-weight ratio (1.17 kg/HP) compared to the F3 675. And that’s not all; the response to acceleration under all conditions as well as the smoothness of the power delivery at mid-range rpm are remarkably improved. These two crucial factors immensely increase the pleasure of riding on the road and decreasing lap times on the track. The 148 HP power output translates into a top speed of around 269 km/h coupled with a modification to the final drive ratio which has been increased from 16/43 to 17/41. Lastly, the mechanical slipper clutch system designed and developed by MV Agusta allows the best performance to be achieved even under hard braking. 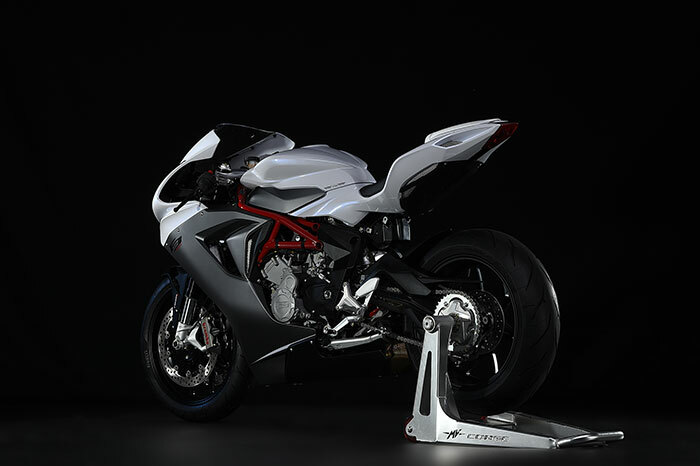 The three-cylinder MV Agusta project has brought the most advanced electronics ever seen to the middleweight category. The MVICS 2.0(Motor & Vehicle Integrated Control System) platform combines total electronic control of the throttle and throttle body with traction control. The Full Ride By Wire is to all intents and purposes the technological basis of the MVICS 2.0 platform: the system makes it possible for the ideal throttle body aperture to be defined at any moment in time, so it is not dependent on the angular rotation of the twist grip. There are in fact no mechanical constraints between throttle and butterfly: the injection mapping and ignition are what defines the optimum fuel-air mix to give the best performance at all times and under all load conditions. 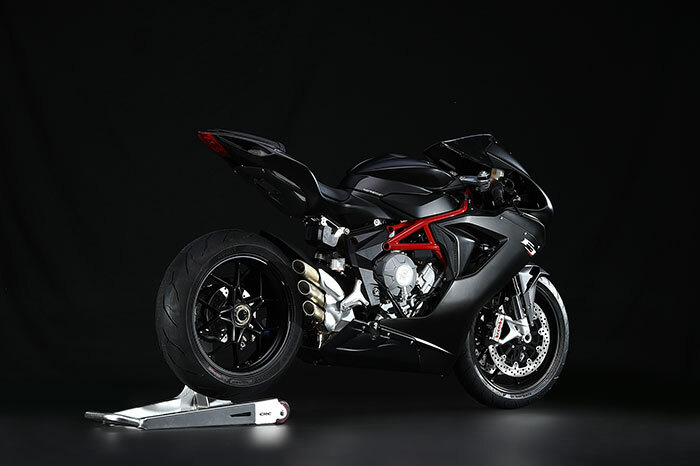 The MVICS 2.0offers a multi-map approach, with three maps devised by MV Agusta technicians and one that can be fully customized by the rider, who mixes the parameters available to obtain the closest solution to his needs. 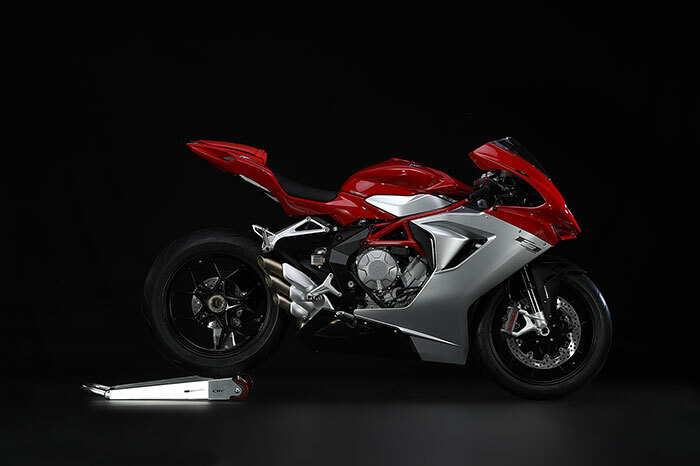 The excellent handling of the F3 675 is present on the MV Agusta F3 800. Beginning with the wheelbase of a mere 1,380 mm which is a record achievement that acts as the basis of the exceptional ease of handling of this revolutionary three-cylinder. The frame is the result of a clever combination of a main structure in ALS tubular steel and a middle section comprised of a pair of cast aluminum side plates, as well as the extended swingarm (576.5 mm) which has been designed to provide maximum traction. The sophisticated Marzocchi front forks with 43 mm diameter legs and 125 mm of stroke offers adjustable spring preload and both compression as well as rebound adjustment. The fork and shock valving is dedicated in order to take full advantage of the higher performance 800cc engine. The Sachs mono-shock absorber with a travel of 123 mm has a separate piggyback nitrogen reservoir and is fully adjustable for spring preload, compression and rebound. The brake system has been upgraded to include the Bosch 9 Plus ABS system as well utilizing Brembo monobloc (M4.34a) front calipers to guarantee unrivaled braking performance even under the most severe conditions, especially at the track. There is no change in the diameter of the two front discs (320 mm) and the rear brake system remains a two-piston caliper mated to a single 220 mm diameter disc. The tires fitted as standard are Pirelli Diablo Rosso Corsa; 120/70-ZR17 on the front and 180/55-ZR17 rear. (at the Crankshaft) 148 HP at 13000 r.p.m. Max. Torque-R.P.M. 88 Nm (8.97 kgm) at 10600 r.p.m.